I decided to review this product because I was asked on one of my older posts when I briefly mentioned it. I went out and bought that product and have been trying it out for around a fortnight now and I think that I have finally made my mind up about it. I heard about this product quite a while ago now when the whole Rimmel Wake Me Up range first came out in the drugstores. I have wanted to try it since then, but it has always just been something that I forgot to pick up and I already have some amazing concealers in my collection and I didn’t really find it necessary to buy another one, but here I am! 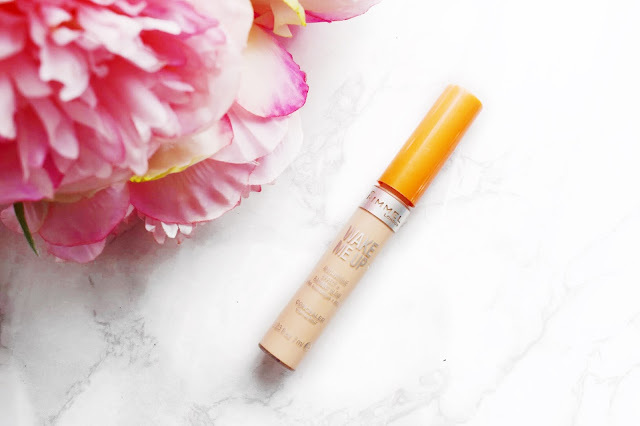 When I started trying out this Rimmel Wake Me Up Concealer I really wanted to give it a fair shot before I uploaded a review on it and that is why this is coming at you a couple weeks after I bought it. If you have visited my blog before you will know that I adore the MAC Studio Fix Concealer, so it had hell of a lot to try and live up to because if you saw my review of the MAC concealer, you will know that I adore it. I also wanted to try and pair this with different primers and foundations so that I could see how it performs with different products. In giving this Rimmel Wake Me Up Concealer a fair trial, I used it in the same way that I would any other concealer. It end to apply a very small amount on top of my primer and before I go in with my foundation. I will then blend that in using my damp Beauty Blender. I will then go in with my foundation as normal. Then to highlight the under eye, I will go in with a touch more concealer in a downwards triangle to lighten the whole area and I will again blend it with my Beauty Blender. The reason why I go in with my concealer twice is because I work some really long hours and it shows around my eyes. What I will say is that this concealer applies very nicely. It blends into the skin beautifully and looks nice and natural on the skin. I would say that once this concealer is blended in, it gives a medium coverage, which is a little too light for me and with how much I have to cover. Even after using this concealer and going in with my foundation, I could still see my darkness peaking through. I will say that once I set my skin with translucent powder there was a slight improvement, but I could still see the blue tones around my eye areas. As I wore this throughout the day, I found that it seemed to break up in the areas that I get pretty oily, which for me is around my nose. It actually made my skin look like it had cracked because obviously as my natural oils tried to escape, the concealer just appeared to break down. I know that it doesn’t really sound like a big deal, but I want my makeup to be able to last all day long and be able to look good all day. The last thing I want is a makeup meltdown. Plus, I have tried other drugstore products that don’t do this as I get slightly oily. This is a low-cost concealer, and for the money I think that it is ok. If you are a fan of a lighter coverage, then I would say to go for this. But for me, when I reach for a concealer I want it to cover everything, otherwise what is the point? I will try to get my money's worth out of this concealer and use it up, but I cannot see it being one of my favourites like my trusty MAC Studio Fix Concealer. I will leave a link to this down below in case you want to check it out for yourself. Make sure to leave me a comment down below and let me know if you have tried this and what you thought about it!